Dear Mona, I’ve Been in My Job For 3 Years. Am I Normal? I have been in the same job for three years. Am I normal? My answer depends on your career aspirations. 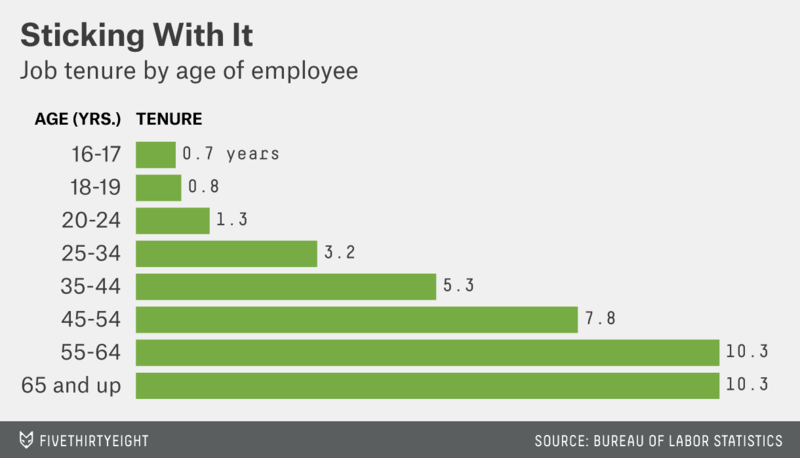 Three years is the median amount of time someone your age stays in a job. But if you intend to stick around your office for a very long time, you’re going to become a lot less normal. Job tenure varies depending on the age of the employee, as well as the sectors in which she works. Even gender can affect the number of years someone stays in a job. Let’s start with age. The Bureau of Labor Statistics (it’s the source I’ll be using for all the data here) has the median number of years someone has been with her current employer as of January 2012. The BLS uses the Current Population Survey to make those calculations, figures that are based on responses from about 60,000 U.S. households. So, according to the chart above, you seem perfectly normal. But medians aren’t everything, Melissa. If you were in a class of 29, and you found out that you got the 15th-highest score (that’s the median) on a test, you might not feel satisfied until you knew the results of your fellow 28 students. The BLS understands that, too, so it’s also published a breakdown of the percentage of people who stay in jobs for a given period. That data tells a slightly different story. You’re in the “normal” majority because 65 percent of workers your age have been in the same job for four years or less. Unsurprisingly, the detailed breakdown shows that not everyone your age is making career moves with the same frequency. There are the 7.5 percent of employees in your age group who have been in their job for 10 years or more (presumably some of them straight out of high school) and, at the other end of the spectrum, there are the 25.5 percent who have been in their positions for only 12 months or less. The latter group are what people have in mind when they talk about millennial job-hoppers; that group of young adults who are said to be are shifting from employer to employer. I expect you had some of those peers in mind when you wondered about how normal you are. 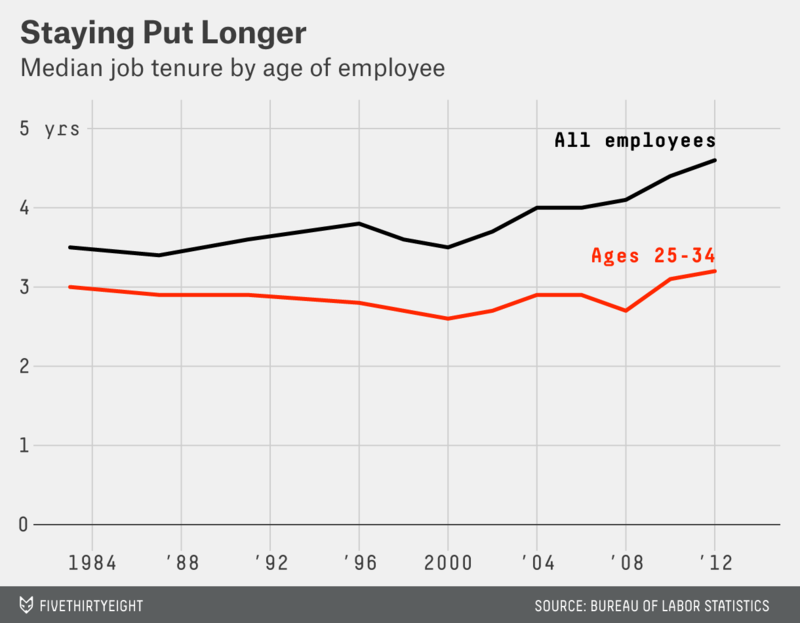 It’s true that young people tend to change jobs more often than older people, but that’s always been true. There’s little evidence that someone like you is actually more restless than your parents were at the same point in their careers. In 1983, the median number of years employees had been in their roles was 3.5 years. Specifically for those ages 25 to 34, it was three years. Between 1983 and 2000, the number of months that Americans ages 25 to 34 stayed in their jobs trended down, but since 2002 — excluding a blip around the recession — that trend has reversed. So, millennials are hanging around longer than the generation before them! Industry also matters here. “Food services and drinking places” have the lowest median job tenure at 2.1 years. And, in general, people stick around far longer in the public sector than in the private sector. Employees who work for the federal government have typically been employed for 9.5 years; in local and state government, it’s 8.1 years and 6.4 years, respectively. The private sector’s median job tenure is 4.2 years. That’s not a trend that is specific to the U.S., and plenty of reasons have been put forward to explain that gap, such as higher job security in the public sector and evidence that risk-averse people are drawn to the public sector. It’s probably relevant that employees in the federal government get much better financial compensation (median earnings of $1,072 per week) than local government ($866), state government ($854) or the private sector ($742). But let’s get back to tenure. Among workers of all ages, men tend to stay at their jobs longer than women, although the gap has steadily narrowed since 1996 — it used to be months, now it’s days. For employees your age, men typically spend an extra 37 days more in a job than women do. So, if you’re still in the same role 32 years from now, write to me again. I’ll probably have a very different answer for you.